Can anyone imagine that Bollywood film director Kabir khan is on the panel of National Security Advisor Ajit Doval and his anti- Pakistan movies like `Phantom` are RAW funded? And Kabir’s visit to Pakistan during last week of April, 2016 was for a `purpose` – he was given task by his `handlers` (Ajit Doval & RAW) to calm down voices raised in Pakistan after catching alleged Indian master spy – a serving Indian Naval Officer Commander Kulbhushan Yadav. You would not have imagined even in your dream that United States can use its HAARP technology to trigger a 7.1 magnitude earthquake that hit Pakistan in April 2016. Had you? Well, all this and many more ground breaking revelations can be easily found on Pakistani news channel. Perhaps rest of the world needs tolearn from Pak media how to see everything through a special prism, understand the importance of `timing` of any event & how to `connect the dots to understand whole game`. Media play a big role in shaping psyche of a community or nation. And most of times, media also reflects thinking or thought process of the same community. It will not be realistic to say that media is a 100% reflection of a community but we can safely keep that figure at 50-60%. If someone follows Pakistan’s media (both state & private), he will be compelled to notice that barring few exceptions, almost entire media is obsessed with one assumption `Pakistan is a target of international conspiracy`. It does not matter if they are discussing any act of terrorism or war in Pakistan/muslim world, bad state of Pakistan’s economy or Pakistan’s law and order situation, they will somehow conclude the entre debate by blaming some `international power` for conspiring against sole nuclear power state of Islamic world – Pakistan. There are around 30 news channels in Pakistan and fortunately they hold 1-2 talk shows every day,which is a very positive sign for any community as it shows that community as a whole want to discuss issues encircling them. But the way most of these talk shows are conducted, proceed & end is very interesting. In most of these talk shows, there will at least one retired Army general or Air force officer in the panel of the guest, who would be asked for his analysis on just about everything – be it politics, geopolitics, impact of politics or geopolitics on Pakistan/muslim world, terrorism, security matters, economic situation & economic policies of Pakistan and sometimes even on sports! While anywhere else in the world, guest panel is finalized on the basis of expertize of people on the subject in hand. They discuss all pros & cons, argue in favour of the subject or against it and discuss every aspect – good or bad. But this simple logic seems to fail in Pakistan, where any one from the `establishment` or supporter of the establishment is treated as a master of all trades. Sometimes entire panel is handpicked & represents a particular mind set, which will drive the discussion in a desired direction. I am not saying that everyone involved in Pakistan’s print/electronic/social media is a conspiracy theorist. There are few sane minds who challenge such conspiracy theories & project more realistic picture of overall situation, however their number is not good enough to change the situation in near future. Let see how these hawks try to change public opinion by covering country’s mistakes & by projecting that the bad state of Pakistan is due to a grand international conspiracy designed and executed by almost entire world except their all-weather friend China. Hawks blame RAW & CIA for almost all terrorist activities in Pakistan. They will claim with conviction that RAW & CIA created TTP (Tehrik-e-Pakistan Taliban). They will not project true history of creation of Taliban & separation of TTP from Taliban. Taliban were created by Pakistan itself during Afghan Jihad. It was massively funded by CIA to fight against Soviet occupation of Afghanistan. Basically USA was playing same game against Soviet that soviet played in Vietnam, where USSR supported native resistance against USA and defeated USA. USA wanted to train & fund native militia to resist USSR forces. Saudi Arabia had promised to match USA’s budget allocation in this regard. They had their money taps open. Secretly Pakistan used a lot of this fund to further fund separatist groups of Punjab & Kashmir. End result of almost 10 yearlong Afghan jihad was withdrawal of soviet forces from Afghanistan & eventual collapse of USSR. Having achieved its objective in Afghansitan, USA moved out & did not do anything to rehabilitate Taliban, who were/are basically mercenaries. Pakistan was in no mood to do so either. In Taliban, Pak Army found a very cheap & safe state tool to bleed and defeat their arch rival India. `If we could increase cost of occupation of USSR in Afghanistan to such a point where USSR was forced to vacate Afghanistan (and was eventually dis-integrated), so why can’t we repeat the same model in India` – was the thinking of top Pak Army brass. They shifted a significant number of jehadi’s from Afghanistan to Kashmir. Pakistan preserved the jihadi culture. After 9/11, Pakistan had no choice but to side with USA. President Musharraf took this opportunity to gain support of the USA (and rest of the world) to consolidate his illegal position. Taliban rulers of Afghanistan stopped getting same kind of economic, moral & logistic support from pak as they used to get. Moreover Musharraf gave few air bases to US Air Force to operate from. When Taliban started getting killed in Afghanistan, a fraction of it got separated from Taliban & formed TTP. TTP made Pak’s KPK province (then North West Frontier Province) and frontier belt as their base. They declared Jehad against the State of Pakistan which was a partner of Killing of Muslims in general & Taliban in particular in Afghanistan by the USA – an occupation force. But hawks of Pak media will not discuss any of this & will portray a different picture. They will straight away blame USA for abandoning Pak after withdrawal of Soviet forces from Afghanistan (as if USA should have adopted Pakistan). They would go on by saying ` we have been fighting USA’s war in this region since Soviet occupation of Afghanistan in 1979. For America’s war in Afganistan, we created Taliban and allowed millions of Afghan refugees in Pak. Refugees brought culture of Nrcotics & Kalashinkov with them, which tore apart our social fabric. After the afghan jihad, it was Amrika Bahadur’s responsibility to help us rehabilitate Taliban & refugees but USA abandoned us`. This way they narrate a nice story of USA being responsible for creation and continuousexistence of Taliban, which eventually led to 9/11 and then to USA’s invasion of Afghanistan and its fallout in Pakistan. They hold RAW responsible for creating & funding TTP. In short, rest of the world is responsible for present law & order situation of Pak. Hawks would never mention that Pakistan never wanted Taliban to disappear after Afghan Jehad. Pak establishment helped Taliban to capture Kabul & to run the government there. Pak was the first country to recognize Taliban rule in Afghanistan & provided all needed moral, economic & logistic support (Pak used to give 50000 litre of oil to Taliban every day!). 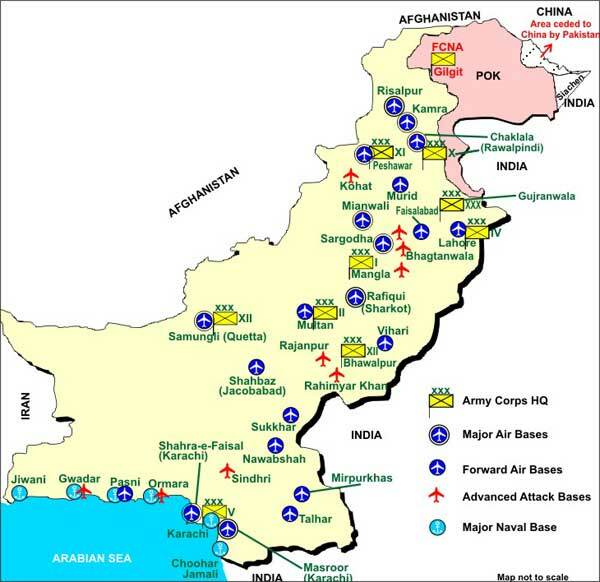 All this was done to maintain `Strategic depth` in Afghanistan. Now when that strategy has back fired, they need someone to blame. Probably Pakistan is the only country where you will find `experts` (sitting on national TV) finding hand of USA’s HAARP (High Frequency Active Auroral Research Program) behind most of the natural disaster. HAARP is actually jointly funded by US Air Force, US Navy, University of Alaska & DARPA (Defense Advanced Research Projects Agency). Its purpose was to check potential of Ionosphere for radio communication &surveillance1. Pak `experts` claim that US uses HAARP to send high frequency energy radiations in Ionosphere that causes weather changes, which result in heat waves, floods & earthquakes. Any decent elementary school book will tell you that earthquakes are result of movement of tectonic plates & human have no potential whatsoever to influence that. Looks like such books have not been able to make much headway in Pakistan. You can find number of such bizarre ground breaking revelations in Pakistani media. Even if, for a moment, we buy these theories, one wonders why entire world is conspiring against Pakistan? Conspiracy theorists have an answer ready. It is because Pakistan is the only nuclear armed Islamic country in the world & all major covert & overt powers (USA, India, Israel, western world in general, CIA, RAW, Mossad etc) want to de-nuclearize Pakistan. As per these `experts`, Pakistan is the only muslim country of the world that has both nuclear weapon & missiles to deliver the weapon and it is Pak’s duty to provide nuclear umbrella to all brotherly muslim countries. This makes Pakistan most powerful country of Islamic world & a natural leader of Islamic world. And this is the `fact`that haunts foreign powers & they are hell bent to stop Pakistan from becoming leader of Islamic world – a dream that Z.A. Bhutto saw in 1970s. Because of military might of Pakistan, foreign powers cannot afford to invade Pakistan, thus they have resorted to such conspiracies. Foreign powers have ganged up against Pakistan. If media does not retrospect honestly and injects society with such slow poison, country will never be able to take corrective measures. They will continue on the same path that leads to religious extremism, jehad & conflict with neighbouring countries. After all such propaganda gives much needed oxygen to anti India & anti US sentiment, which is so necessary for the rule of `establishment` in Pakistan. If there is no anti-India sentiment, Pak establishment fears that it will lose its relevance & the power share it has been enjoying for last 68 years. This is one of the reason that they continue to back or support such hawks in media. If there are such patriots in any country who are poisoning the society with lies and conspiracy theories, do they really need any external enemy? Well described facts..please dont hesitate to use those so called defense analyst which includes zaid hamid (luckily) survived in saudi arabia, some so called dr….and ex pak general from sorry jernails…however there are some nice people like hasan nishar, najam sethi, parvez hoodbuy but all such people are considered are indian agent ..
Amazing read for people interested in Politics/ Defence ! Keep the good work – look forward to read more such deep articles drilling facts. This type of information only sumit can give US.